"We owe him a debt of gratitude that can never be repaid." Joseph Shigeo "Joe" Takata was born on April 29, 1919 at Waialua in the Hawaiian Islands in the shadow of Mount Kaala where the sugar cane swept up to the foothills of the highest peak on Oahu on one side and sloped down gently to the sea on the other. Like many people in Hawaii, he was Nisei - second-generation Japanese. And like many Nisei, he loved baseball. Takata attended McKinley High School where he quickly earned a reputation as a power-hitting shortstop. "I can still see Joe there at shortstop," remembered his coach Frank J Hluboky, ten years after the ballplayer's death. "the way he ran out to his position, the way he hustled. "He was a hard worker, that boy. The first to come out for practice and the last one to leave, after helping to put away the equipment. He was like a good leader." In his senior year at McKinley in 1937, Joe helped bring a championship to the school in a three-game play-off with St Louis College. After graduation Takata worked as a stevedore for Castle & Cooke, and went on to star as an outfielder in the amateur Hawaii Baseball League with the Azuma and Asahi teams. Takata entered military service November 15, 1941. Three weeks later Pearl Harbor was attacked by the Japanese. While most Japanese-Americans were sent to internment camps, the Japanese-Americans of the Hawaiian Territorial Guard became the 100th Infantry Battalion. Two weeks before leaving for basic training with the 100th at Camp McCoy, Wisconsin, Takata married the beautiful Florence Sakamoto from Honolulu. Assigned to the 100th in Wisconsin as Recreational and Morale Officer was Captain Katsumi "Doc" Kometani, who had been the franchise owner of the Asahi team. Shortly after the battalion's arrival at Camp McCoy. 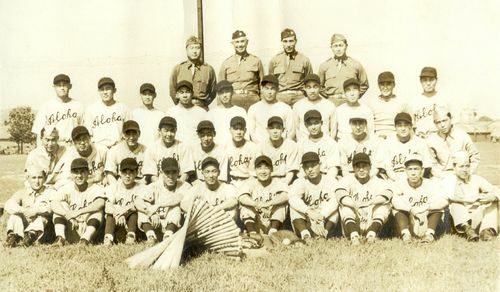 Kometani organized the Aloha baseball team. Takashi "Ted" Hirayama was selected as team manager and remembers Takata well. "He was a natural athlete, with a good swing and good enough speed," says Hirayama. "Joe had a really good arm. so he played shortstop and centerfield." The Aloha team initially played against the military police unit at Camp McCoy but soon found competition in nearby towns. In a memorable game against a minor league team in Green Bay, Wisconsin, Takata was part of an outstanding defensive play. "An opposing batter hit a towering drive over our rightfielder's head," Hirayama remembers. "After the outfielder retrieved the ball, he threw it to Joe, who was playing center. Joe relayed it on a line to our second baseman, who then turned and threw the ball on one skip to the catcher, who tagged the surprised runner out. Joe's throw to the second baseman was outstanding. I still remember the announcer saying that it would take a major league team to make a play like that, and these little guys from Hawaii just did it. They play like pros." In February 1943, the 100th Battalion moved to Camp Shelby, Mississippi for advanced unit training. The Aloha team continued to play and in a game against an Army team at the internment camp in Jerome, Arkansas, Takata showed his power with a home run that was the longest drive ever seen in that field. The 100th Battalion left Camp Shelby for North Africa on August 11, 1943. They landed at Oran, Algeria on September 2, where they guarded supply trains for a couple of weeks. There was still time for some baseball in North Africa. Takata was one of five 100th players selected to join the 133rd Infantry Regiment team in a game against the 168th Regiment - undefeated champions of North Africa. With the help of the Hawaiian players the 133rd won the game. "It was a close game all the way to the ninth inning," explains Hirayama. It was in North Africa that the Aloha baseball team played their last game. Challenged by the 133rd, the 100th called upon Lieutenant Paul E. Froning, who had just joined them. Froning would pitch in the minors after the war and helped defeat the 133rd, 26 to 0. On September 19, 1943, the 100th Battalion left the relative safety of North Africa for Italy. They landed at Salerno and advanced to their first objective - Monte Milleto. Sergeant Takata's platoon led the rest of the battalion along a portion of road bordered by a gully on one side and an olive grove on the other. It was 9.15am on September 29, 1943. It hadn't stopped raining all night. Suddenly the platoon was trapped by a hail of machine-gun, mortar and artillery fire. "As soon as the machine guns opened fire, the [artillery] fired," recalled Sergeant Tokuichi Koizumi some years later. "On the left flank was open ground. We tried to get around the right side, but there was a ravine there and the guns already were zeroed in on the place. "A shell landed. It hit the ground in front of Sergeant Takata. He was alive for about two minutes. He couldn't talk ... I never forget that day. I never forget him. He was one of the best." The 100th Battalion eventually silenced the enemy but their baseball hero and leader, Joe Takata, was dead before the fighting was over. The Takata family and his young widow, Florence, were devastated when the news reached home. Instead of following the Japanese custom of distributing tea or coffee, a custom traditionally followed in honor of the memory of the dead after 49 days, the Takata family decided to give a $400 contribution to the Red Cross, Army relief fund, Navy relief fund and Honolulu Community Chest. "The war has come closer home to the Waialua community and to me when it claimed my husband as its first casualty," his widow explained at the time. "We feel that it has become our duty to do more for the war cause here on the home front and forget all the old customs. This idea received the wholehearted approval of both the Takata family and my parents." For "extraordinary gallantry in the face of enemy fire," Takata was posthumously awarded the Distinguished Service Cross which was presented to Florence on June 11, 1944 by Colonel Kendall J Fielder. "Joe was a jovial, good natured guy who had that amazing zest for life few have," remembered Tokuji Ono, who led Takata's squad after his death. "You'd first think of Joe as the kind of guy everyone likes. He did things wholeheartedly whether it was baseball or Army Training." "He was a master soldier. A great athlete, a great leader," remembered Lieutenant Colonel Farrant L Turner, Takata's battalion commander, at a remembrance ceremony in 1955. "He would have gone on to great things if he had not died." In September 1946, an American Legion Post was named in his honor. Joe Takata is buried at the National Memorial Cemetery of the Pacific in Hawaii. 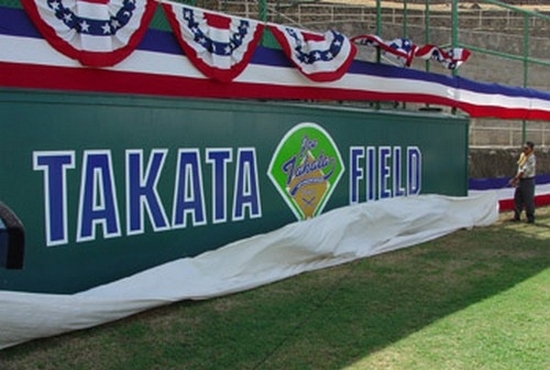 In June 2003, the baseball field at Hawaii's Fort Shafter was named Joe Takata Field in his honor. "Renaming the baseball field is the Army's way of paying a lasting tribute to a fine athlete and soldier who sacrificed his dreams for the cause of freedom, and paid the ultimate price," said Lieutenant General James Campbell, US Army Pacific commanding general. "We owe him a debt of gratitude that can never be repaid." Thanks to Kerry Yo Nakagawa of the Nisei Baseball Research Project and Hawaii State Library for help with this biography. Photo of 100th Battalion team courtesy of Sons and Daughters of the 100th Infantry Battalion Archives. Visit www.ajawarvets.org for more information on Americans of Japanese ancestry servicemen. Thanks to the Honolulu Advertiser for supplying copies of related press articles.